1/ Inform — Are Your Messages Being Read? There is of course real value in keeping families informed about activities at your childcare or preschool. The more they feel part of your school, the more confidence they will have in the job you are doing for their child. However, to inform you need to reach. And reaching parents is not that easy. So much sent home in backpacks ends up not being read, and email is losing its effectiveness as parents contend with spam-filled inboxes and virus hazards. In addition, younger parents are digital natives, more likely to communicate via a phone app rather than email. And so early learning programs are under pressure to add new forms of communication to meet the increasingly diverse needs of their family clients. That all takes time. 2/ Engage – Are Your Parents Providing Enough Feedback? Beyond informing, sending out the information, preschools need families to respond, to interact. When they send messages about their child, they want to inspire a response. Invites to fund-raisers or children’s events, signing of health forms or travel permission slips. Whatever it is, they need parents to engage and respond. Also, if there is a problem at home related to school, if a child is struggling in some way or is unhappy, the school would want to know. Again, there are challenges due to the busy lives parents lead and the multiplying communication channels. Engaging parents, building and growing a connection, is easier said than done. The aspect of family engagement that has made it a focal point for rating and compliance agencies the world over is “authentic collaboration” — the idea of forming a partnership between the teacher and parent, school and home, that creates continuity in learning. The learning does not have to stop just because a child has gone home. This continuity or extension of the learning requires parents and teachers to be on the same page. Most parents will love the suggestion of something to do with their child. For instance, if the school is working on the letter B, parents can play Eye Spy with B at home. Authentic collaboration is a two-way channel. By sharing cultural traditions, child history, information about the home environment and feedback from the child about activity at the school, families are able to help teachers understand their children. This allows the teacher to individualize instruction in a way that would not be possible without collaboration. Parents are invited on and then encouraged to invite extended family and specialists, creating a private community around each child. Teachers share stories, notes and observations — individually, by class or by custom group — with parents only or with all invited parties and then save to the child’s portfolio, all in one click. Family members are able to view and respond on a phone, iPad or computer. Educa reports help directors and teachers see what communications are influencing family engagement. 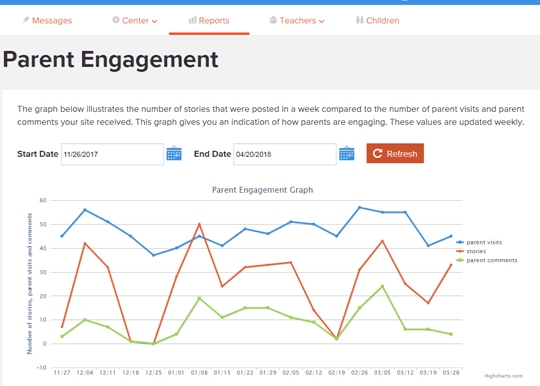 Educa tracks who views each posts, which parents are active, and probably more important, which parents are not. Every feature in Educa has an educational purpose. Every group or individual observation made or curriculum item shared creates new learning opportunities at home as parents reinforce the learning or even take it one step further. A child who plays a ukulele at school might engage more in music at home. Effective communication is essential to building partnerships between educators and parents. Parents need confidence that their child’s needs are being well served. A private and open communication two-way communication channel that promotes honest and constructive exchanges achieves that goals. While this is an extreme example, parents are less and less likely to have time at drop-off to build a connection to teachers. In fact, care-givers drop off many children, not parents. This puts enormous pressure on communication, giving rise to new communication tools like Educa. At the heart of a parent collaboration is shared learning. While there are the benefits of parents reinforcing the learning at home, creating new learning opportunities, and from being able to individualize instruction based on a better understanding of a child, there are unexpected benefits also. For instance, the sharing leads to a lot of positive feedback, something teachers don’t get enough of. Read more unexpected benefits from shared learning here.